This fall, the Milwaukee Art Museum and Wisconsin Energy Foundation present some of the greatest drawings and paintings ever produced by Netherlandish artists in the exhibition Rembrandt and His Time: Masterworks from the Albertina, Vienna. Including 115 drawings and prints from the Albertina and 15 related paintings, the exhibition explores the pivotal and influential role of Rembrandt as a draftsman in mid-seventeenth-century Holland. Visitors have the unprecedented opportunity to see 26 of Rembrandt's drawings and prints—the largest number of Rembrandt works ever lent by the Albertina. The exhibition is organized in conjunction with the 400th anniversary of Rembrandt's birth in 2006; Milwaukee is the only venue. Click here for a behind-the-scenes look at the uncrating of Rembrandt's famous Landscape with the Good Samaritan at the Museum. Rembrandt is universally accepted as one of the greatest artists of all time, and the works on view demonstrate his exceptional facility as a draftsman with different media. The show includes iconic images such as Child in a Small Chair with Nanny, Three Studies of an Elephant, and Young Woman at Her Toilet. Dutch landscape is also represented with such important works as Cottages under a Stormy Sky from the mid-1630s, and View of the Pesthuis from the Ramparts from the late 1640s. Rembrandt's Landscape with the Good Samaritan—one of only eight landscapes painted by the artist—has never before traveled to North America. Lent by the Czartoryski Museum in Poland, this painting belongs to the pivotal midpoint of the artist's career and provides an excellent point of comparison for the landscape drawings. 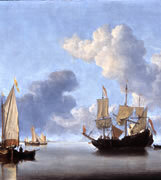 Other paintings include works by Roelant Savery, Philips Koninck and Willem van de Velde the Younger. Equally significant are a number of early drawings by Roelant Savery, David Vinckboons, Jacques de Gheyn II, Hendrick Avercamp, Jan van Goyen and Esaias van de Velde that provide the earliest examples of an emerging naturalism. There are also works by Rembrandt's contemporaries, followers and by later artists whose innovative approach to recording the Dutch world takes the work of Rembrandt a step further. These artists include Jan Lievens, Lambert Doomer, Philips Koninck, Nicolaes Maes, Salomon de Bray, Govaert Flinck and Adriaen van Ostade. Marine themes and Italianate landscapes are also explored as a means of fully explaining Rembrandt's broad influence. The exhibition is organized for Milwaukee by the Albertina in Vienna and curated by Marian Bisanz-Prakken, curator of Dutch art at the Albertina. The exhibition is coordinated at the Milwaukee Art Museum by Laurie Winters, curator of earlier European art. The exhibition is sponsored at the Milwaukee Art Museum by Wisconsin Energy Foundation and Argosy Foundation. Partial funding provided by an indemnity from the Federal Council on the Arts and Humanities. Willem van de Velde (the Younger), Seascape, Private Collection. Rembrandt Harmensz. van Rijn, Cottages under a Stormy Sky, c. mid-1630s. Pen and brown ink, brown and gray wash, white bodycolor, on brownish prepared paper; missing corner at upper left, restored. Albertina, Vienna. 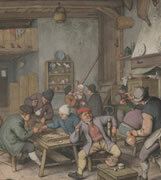 Adriaen van Ostade, Room at an Inn with Peasants Drinking, Smoking, and Playing Tric-Trac, 1678. Pen and brown ink, watercolor, bodycolor, over black chalk. Albertina, Vienna. Rembrandt Harmensz. 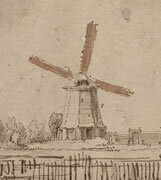 van Rijn, Landscape with Windmill and a Country Estate (detail), c. 1651. Pen and brown ink, brown and gray wash, on brownish prepared paper. Albertina, Vienna.